All apologies to the melancholic Jacques, Shakespeare’s life is a stage soliloquist in ‘As You Like It.’ Nobody understands a stage better or takes it with more enjoyable ferocity than the wild boy phenomenon of the Food Network, Guy Fieri. Of course, all apologies also go to Guy for anyone mentioning Shakespeare in a story about him. It isn’t that Guy isn’t bright and worldly enough for the allusion; it is because he is virtually without guile. Jacques would get a good meal and a patient listen at one of Guy’s restaurants. He would eat too well and laugh too much to leave in a bad mood. Guy is a delight, a kid from next door who was brought up to understand the importance of working hard, and over the years melded an impossible work ethic with a passion for food. Like most Californians, or at least those who don’t live in the towns where he already owned and ran successful restaurants, California Conversations first became aware of Guy when he overwhelmed the competition only by being himself in a contest to become the Next Food Network Star. Even one of his competitors said when she met him she thought only of a Billy Idol punk rocker. When it was over, she wanted him to walk her down the aisle. 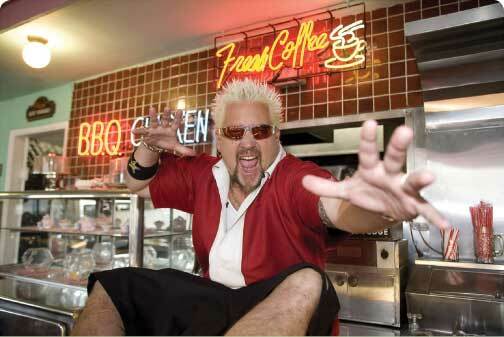 In the two years since his victory, Guy has become the host of two shows-Diners, Drive-ins and Dives, and Guy’s Big Bite-and is the burgeoning network’s highest rated star. The businessman was taken aback. Like the rest of us sitting nearby, he was quickly charmed. Guy likes to laugh and brings everyone within reach into his light. I met with Guy at one of his restaurants. It is a fun place for those who can’t decide if they want barbecue or sushi. California Conversations: Tell us about the hair style. Guy Fieri: I’ve had hair down the middle of my back. I’ve had the mullet. People have asked me, “Do you perm your hair?” I was in Vegas and a friend of mine shaved his head and wanted me to do the same thing. I called a friend and she said if you cut your hair and don’t let me cut it, I’ll never speak to you again. I flew home the next day. She said I’m bleaching it. I said cool. (laughs) I’ve got long, curly black hair one day and I go walking into the restaurant with bleached blonde spiky hair the next. CC:	How long ago was that? CC:	You’ve kept the style since then? GF:	Oh no. I’ve been super short. I’ve been black. I’ve been burgundy. I’ve been all different colors. My wife likes my hair black, so I dyed it black for Christmas. (shrugs) I don’t want it to be all that I am. It’s like this thing with the jewelry. I always loved jewelry. My parents sold belt buckles. I always had these nice belt buckles when I was a kid. CC:	Does the look play well everywhere in the country? GF:	I’m just going by the beat of my own drum. CC: I hate to make my first question about food a tough one, but I can remember when growing up there was no such thing as epidemic childhood obesity. GF:	The availability of food is far greater than it’s ever been. You used to only be able to get certain items at certain times of the year. We are in the land of excess. We have to be contemporary to get a handle on the fundamental issue that just because Coca-Cola is available, doesn’t mean you should drink it every day. I call it the food movement. Not slow food or fast food or any of that. I’m trying to empower children to learn how to cook. If we can teach a hungry kid how to make a peanut butter and jelly sandwich they are empowered to understand the direct correlation to an end result. 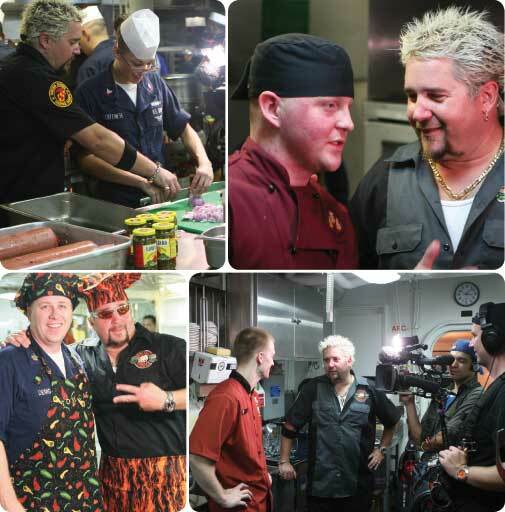 Diners, Drive-Ins and Dives takes Guy everywhere in the country. It is a phenomenally successful program for the Food Network. CC:	Diners, Drive-ins and Dives? CC:	Do you just show up? GF:	We have an expectation of recipes. I gotta know what’s going on because I have to be able to highlight them. We shoot for about nine hours in a day. I love the show. It highlights America. You talk to these people, and you learn about them betting it all on the red. CC:	Have you followed up with people on the show to ask if it’s changed their business? GF:	Yes. Some of the letters will bring you to tears. CC:	Is the food always good? GF:	Incredibly, to the item. But, if it’s not good, I won’t shoot it. I’d never embarrass anyone...I ate a hamburger with peanut butter on it...I don’t like that. It’s funny, because it’s unique. It wasn’t the drive-in’s foundational item. (laughs) It’s not like we’re at the home of Mom’s Meat Loaf saying, Gee, Mom’s a terrible cook. That’s just not my nature. Also, there’s good in everything. (still laughing) I had a lady jump me about a place in San Pedro, California. She said I can’t believe you told me to go there. She said I had the hamburger and it wasn’t incredible. I said if I’m correct, we focused on the waffles. (laughing and shaking his head) She said I don’t like waffles. CC:	Do you still remember the fried chicken they dipped into a vinegary barbecue sauce? CC:	I wanted to be there after I saw your show. It is not immediately natural that a food network would become successful. They have managed to create a grouping of stars that are as recognizable for their personalities as they are for their recipes. CC:	Is there competition between the stars on the Food Network? GF:	We’re rarely there at the same time. We had holiday shows together, but you don’t walk down the hallway and say Hey Rachael, what’s up? I was there when Emeril was shooting the other day and didn’t see him at all. CC:	Are they all great chefs? GF:	The only time I get defensive is when someone says to me, well, someone is not a chef. Says who? My factor is this...first, do you cook? Yes. Do people eat it? Yes. Do they pay you to do it? Yes. Then I call you a chef. Guy stops to sign an autograph. He compliments the employee who brings the enthusiastic fan to our table by saying nothing matters more than taking care of the customers. The logic is simple to him. CC:	Do you have a favorite recipe? GF:	What time is it and what day is it? No, there’s not a favorite recipe. There is a quest for the recipe. CC:	How do you come up with your recipes? GF:	A lot of it comes from inspiration. I’ll eat something and think, “What can I do with that? It’s just having all of your senses open; taste, smell, vision, touch. I’ll open the fridge and start with a protein, then spices and pasta...next thing you know I have an Italian, Mexican and Asian creation. CC:	How did you come up with fried bologna? GF:	I like to use a one-liner that if it’s funky, we’ll find it...I go to these barbecue competitions and there are thousands of people there. It’s great. I went to a team and I tasted their food. It was great, and I said, “Is this baloney?” They said it’s bah-low-nah...(laughs)...it’s the cultural exchange...I got them to try sushi for the first time. CC: How do you make different ideas work in a restaurant? GF:	You’ve got to have water flowing through the pond. If I can’t turn the product theoretically in 48 hours, I’m probably not going to do it. Now, the sushi we want to have it day-in, day-out. It’s kind of like the survival of the fittest. CC:	Winning the Next Food Network Star must have changed things? GF:	The phone started ringing off the hook. Hey, they wanted to know, can you do an event in Chicago? Yeah, I’ll do that...in Philadelphia, yeah, San Francisco, New York, yeah, yeah, yeah. Then the Network says we need five more shows...thirteen shows...twenty-six shows. My whole year was gone. It was the craziest thing I’d ever seen. Finally, I said these 5 days are available to do Food Network stuff. These 10 are not. We tried capturing a tidal wave. CC:	So, five days for the Food Network; are the ten days at home? GF:	Unfortunately, it becomes negotiable. CC:	Does it amaze you that food is your life? GF:	Food has such an emotional context with people. Everybody loves to eat. They think about it. They dream about it. They want it. They crave it. What else do I possess that has contact with every single person? CC: We’re talking about getting people turned on to great food, but you’ve also been quoted as saying Spam rocks. GF:	Food rocks. I don’t care what it is. GF:	It does in its own way...the reality is you can make a dish where you take seasoned rice, sushi rice, and grilled Spam or sautéed Spam wrapped in seaweed. It is outstanding. GF:	You’ll spell it wrong every time, but it is awesome. Look, the thing is I don’t have Spam everyday for dinner, and I probably don’t have any on my shelf...well, hey, I might have some on my shelf at home. Everything to me is great. I don’t care if it is a potato chip. Give me a thick cut. If it is a hot dog, then make it a Nathan’s, you know. What I don’t like is when people cheat. The thing that upsets me about food is when I see food disrespected. CC:	Like how is food disrespected? GF:	Micro-waved, frozen, processed when it doesn’t need to be. A steak is a wonderful piece of meat...a little bit of salt, a little bit of pepper on the right piece of meat is unbelievable. It is crazy how I still see green beans being boiled to the point where they’re green mush. CC:	Did you ever think television and food would be synonymous? GF:	The television part was never something I thought about, but every single meal I eat is important...and not because I’m trying to be healthy, but because eating is an experience. I’ve eaten sushi since I was ten. I look at people and say don’t you wish you tried this ten years ago-ten years of sushi. CC:	Alton Brown had a quote from Julia Child a couple weeks ago. She said she never cared about anything until she learned to cook. GF:	I explain to people that when you live your life in black and white, you can turn it to color. CC:	Why does Sonoma County, California like you so much? They were completely behind you when you were on the Next Food Network Star. GF:	That’s really funny. That actually gives me goosebumps. CC:	They’re promoting you as a reason to visit Sonoma. GF:	I’ll tell you, my business partner and I had a choice to open restaurants anywhere in the country. I said I’d like to go to Sonoma County. Sonoma where? I said, you know, wine country. He said it is too expensive up there. We opened our first restaurant, two young guys, we were 26 years old, no money, we had to beg, borrow, and steal to make it happen. And we did it. CC:	So had you never won Next Food Network Star, you’d still be good? GF:	(laughs) I didn’t even want to do the show. I don’t fill out forms. I don’t wait in lines. I don’t do contests. CC:	How did it happen? GF:	My buddy, Mustard, said you have to do the contest for the Food Network. I said, dude, I was approached about two years ago by young guys from LA who wanted to do a show on the Food Network called the Barbecue King. They asked me and my team if we wanted to be on the show. I thought wow, talk about food, do a show. Unfortunately, they didn’t know what they were doing. The show never came to fruition. End of story. I didn’t want to do the Food Network thing because I didn’t want to put it all out there and then have the dream go away. I think that’s a weird parallel for people to say they don’t try things because they don’t want the dream to leave. I couldn’t fail. I have restaurants. I have my son, my wife, I have my race car. I’m as successful as I ever wanted to be. CC:	You have a big personality and it comes across on the small screen. GF:	I’m in awe of anybody that does what they love to do. I love what I do and I can’t hide it. CC:	Growing up. Your parents were hippies? GF:	Hippies, but not dope smoking hippies. They were from Ohio. They met...they took off in a VW square-back bus with a six-month-old kid and moved to Whittier, CA. They loved it. My mom taught school. My dad worked at the college. Then they got in the van and went farther north on California 101 to Santa Barbara and said this is where we’re going to live. They loved it. Then they drove to Big Sur and said this is where we’re going to live. They loved it there, too. They eventually drove to a town called Ferndale to open a leather store. They sold their purses and leather belts and the candles they made. They eventually opened a store called Dave’s Saddlery, which was a county-western clothing store. (laughs) It was all good. CC:	What were you learning from your dad? GF:	In fifth grade I went to Squaw Valley to go skiing. It was a favorite family trip. We’d get there, and I’d eat the pretzels. (emphatic) I mean I would eat the pretzels. I would eat ten of them. My dad said to me, would you like to have a pretzel cart? I said, “Dad, I would love to have a pretzel cart...that would be the best thing in the world.” My dad told me to ask the pretzel guy where he gets his pretzels. So I asked the guy where he got his pretzels. The pretzel guy said I can’t tell you. I said why not. He said because you might open a pretzel cart. (laughs) I said I’m eleven....My dad told me to sit down and wait until the pretzel guy takes the box to the trash...(still laughing)...and then go get it. The guy went to the trash. I jumped in the dumpster and I got the box. I went back and my dad said fine, we’ve got the source. We went home and my dad helped me build a cart. I had to go every day after school to his wood shop and work on it. It was us working side-by-side to make this fantasy idea. It had become real. 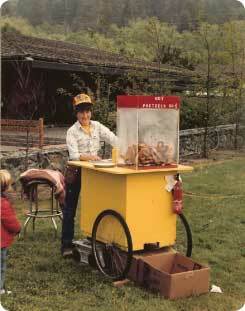 When we were done I had this pretzel cart. I’d sell these pretzels...called the business Awesome Pretzels. GF:	Yes...anything was possible if you worked was the message. My parents never pushed me to do anything. (laughs) Well, they pushed me to toe up. There was no lying. I mean I had open communication with my parents, clearly. I remember a kid making fun of me one time when I was a freshman in high school. He said, you know not everybody loves you as much as your mommy and daddy do. (grabs his chest) I felt like man, how much that kid must have been hurting. That’s such a raw statement to make. I wasn’t offended. I felt sorry for him. Guy used the money he made from the pretzel business to become his version of a foreign exchange student in France. GF:	When I was a kid we had two foreign exchange students. It was so like my parents. When they had time they were driving to Mexico to volunteer at an orphanage...something they do a lot now that they are older and have time. One of the exchange students was from Norway, and one was from Sweden. I loved it. I got to eat funky food with them, got to laugh at them because I couldn’t speak their language. CC:	They lived at your house? GF:	They lived at our house. They didn’t understand things. I felt, God, I’m smart. I had this great relationship. It was like a big brother. I always wanted a big brother or big sister so it was awesome. Then I wanted to be an exchange student. I was always a little ahead of myself. I was a freshman. I wanted to be an exchange student but they said you have to be in a language class. I wasn’t in a language class. They said take Spanish. I didn’t want to take Spanish. I wanted to take Italian. They didn’t have Italian. Of course my parents were always bringing in wayward sailors and we met a cork salesman from France. He was in the wine country during Thanksgiving. He met somebody, my mom’s aunt or something, and came to our house for dinner. I said do you live in France? He said yes. I said I want to go there. He said I will find you a place to live. It happened, just right there. I wouldn’t lay off until my parents said fine. My mom said if you can take a class and learn French and get a B or better, you can be an exchange student. My mom drove me to the College of the Redwoods, fifteen miles from my high school, every day at lunch. I took the class. I got a B. (laughs) I told my parents I was ready to go. At the plane, I was crying my eyes out. I wrote them a letter and slipped it in my mom’s book. My dad said my mom was catatonic for two days. She couldn’t even open the letter. She’d pull the letter out and she’d cry. I landed in Paris. I lived on the third floor of this house. It’s a store room with a bed and a sink. I’m like, oh what have I gotten myself into. Of course, I can’t go home. I just thought I have to figure this out...(laughs) Okay, what’s the thing we did in school-conjugate the verbs. So, I carried a piece of paper and I would say how do you say that in English? I had this huge French verb book and I’d write them down in all the forms and I decorated my walls with them. By the time I left France there were like 300 up there. But, I taught myself how to speak French, and when I left you couldn’t tell I wasn’t from France...(laughs) they just couldn’t tell where the hell in France I was from. I mixed dialects...I would sound like a New York Southerner with a California twang. CC:	How long did you stay? GF:	Almost a year, 11 months. CC:	You’ve been a blessed boy. GF:	Oh, I’ve had tough jobs and tribulations, but I’m so blown away by how much my parents gave. My dad always told me to experience the life that you’re living. I mean we’d shoot twenty-twos off my back porch. I drove a car to the beach when I was 15 years old. It’s not because I was in a country town. It’s because I just had an incredible mom and dad. CC:	What does your son think about you being on television? CC:	Fame, are you treated differently? GF:	Tested. People want to know if you’re the real deal. People want to know if you’re different than you come off on TV. CC:	How do they test you? GF:	Funny ways. They’ll ask when you’re making the meat loaf do you add the onions or the garlic first? (laughs) I don’t know. I made that recipe two years ago, I guess the onions. Really, you don’t know? Usually they say he’s just like he is on TV. CC:	Does fame make you feel different? GF:	It’s about accepting responsibility. I’m honored. I’m still in awe. I’ve got to be honest. Guy doesn’t wear fame any differently than he probably wore being one of the guys in a small town. 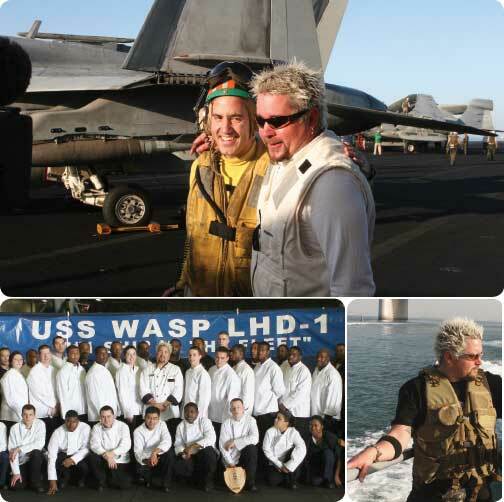 The Navy flew him to the Middle East recently to do shows for the troops on the big boats. He took it in stride, something that seems to make sense in the bigger universe where he is living now. There are new shows to do. There are diners out there with the door open to him. There is no place he can’t go. He’s going to have fun wherever he goes next.